Clumps of chimps falling out of the trees following the crack of overloaded branches. The loud rustle of leaves as the chimps break off fruit. And behind the anthill, Harriet has been grunting, playing patticake, tickling, teasing, playing, and wrestling with Tober for over 30 minutes. The sun is shifting and it’s time to move my towel another 2 feet around the tree. Uh, Oh, Chimp attack! Sandy comes up and starts playing under my towel. I’ve taken my socks and shoes off and I quickly stuff them under the towel. But Tobra rushes up and pushes Sandy away, grabbing a sock in the melee and off he triumphantly tears. Sock tag, sock tag, off they run, up and down the trees, slapping the ground, teasing, leaping onto a branch which comes crackling down and whomp!, a chimp thumps onto the ground, leaps up and gallops off. After ten minutes or so, the sock, stretched, chewed and slightly the worse for wear, drops out of a tree into Harriet’s territory. Got it! I give up, pen and journal go into my pack, and I deposit it in the safe hands of Patrick. No chimp dares to take it from him. And I join Harriet in chimp wrestling. Tara has taught Harriet how to play. By gently taking Harriet’s hand in her mouth, Harriet has learned to trust her. They somersault roll, patticake, and wrestle. 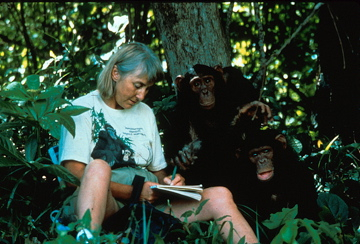 Sandy soon joins her and it’s two to one for the chimps. I observe for a bit. It looks like too much fun to pass up, so I get into the act. Now it’s two chimps to two humans. Sandy and Tara leap on us, somersault and land upside down in our laps. I swing Sandy around by an arm and a leg and he can’t get enough. Harriet has Torah hanging by the feet and swinging. What a barrel of monkeys! I spend a good 30 minutes carefully grooming Torah. He flattens out his belly, head resting on his arms, and loves every second of the attention. When he was playing earlier he would close his eyes, race toward me and somersault into my lap. I get so much joy from some of the interspecies connections that come across my desk I’ve decided to share them on my blog from time to time. I hope you get as much delight as i do when I feel the connection between these two. This was sent to me by my friend, Christine Hillis from Edmonton, Alberta. Christine went to school with my brother, Randy, and became a shopping companion and later a care-giver to our Mother, Marion in the last of years of her life. Mom and Christine came to visit us in Hawaii once, and so our friendship has deepened over the years. Although I don’t see her often, we stay in touch through email and the quote she sent me actually describes our friendship and the friendship I feel for so many of you who have connected with me through TTouch courses, from emails you send me, and from the amazing Facebook. There is nothing more wonderful than animals ! This cat in Harrisburg has her friend that comes to see her every morning. The owner finally took pics. Mele Kalikimaka and Hau’oli Makahiki Hou! 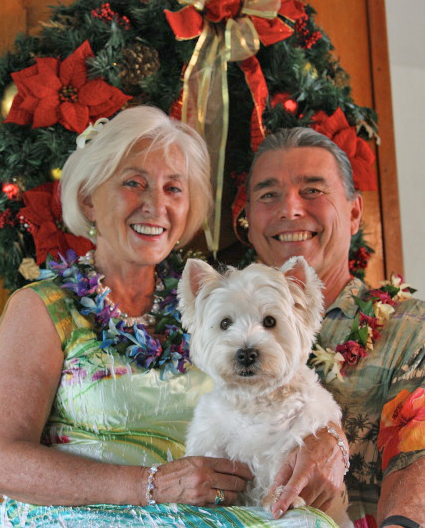 Mele Kalikimaka and Hau’oli Makahiki Hou means Merry Christmas and a Happy New Year in Hawaiian! May this Christmas and the coming year bring you a deep sense of peace and well-being, much joy, great inspiration, boundless vitality and prosperity and the opportunity to make a difference in the world. Planning for my presentation at Xenophon has stirred up wonderful memories of working with Klaus. I am happy to share photos of the two of us and his fabulous horses with you! Check back for more as I locate them among the thousands of images on my little laptop! I had the pleasure of presenting at the zoo in Puenta Verde, Italy last month, along with Massimo Da Re, DVM, a TTouch practitioner. I thought I’d share with you all a picture of Massimo and me working with a very concerned camel. This one was taken by the zoo director. The camel was able to reach out and touch my hand. Then I could TTouch his face! I’m looking forward to more photos from Massimo and the wonderful folks in attendance. Sharing Tellington TTouch® with Bruce Lipton was one of those memorable treasures that makes my heart sing. Bruce is the author of the world-view shifting books, The Biology of Belief and Spontaneous Evolution. He is a brilliant presenter and had more than 500 people on the edge of our seats in his workshop in Grass Valley, California in July. Even though I have studied his new book and made countless highlights, I took reams of notes all day.